The new, signed limited edition Jeff Lynne's ELO: Wembley Or Bust is now available to order. This beautifully presented edition celebrates Jeff Lynne's ELO with extensive photography of their landmark concert at Wembley Stadium, as well as original text by Jeff Lynne. On 24th June 2017, Jeff Lynne transformed Wembley Stadium into one of the greatest rock 'n' roll spectacles of all time, as his band performed their most extensive setlist to date. The show and the story of its production was dramatically captured in thousands of photographs specially for the creation of the new volume. Introduced and narrated throughout by Jeff Lynne, he tells the story behind the concert and reflects on each of the show's songs, drawn from the catalogue of ELO albums that have sold more than 50 million records to date. 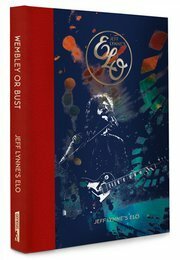 To find out more about Jeff Lynne's ELO: Wembley Or Bust and to secure your copy, click here.